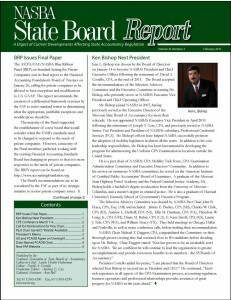 The rigor comprehensiveness and validity of the Uniform CPA Examination were underscored in a letter sent August 30 by NASBA Chair Thomas J. Sadler and President David a. Costello in response to Internal Revenue Service Commissioner Doug Shulman’s call for input regarding the IRS’s proposed registration and regulation of tax return preparers to ensure proper public protection. The NASBA leaders told the IRS that, as stated in the Uniform Accountancy Act: In order to obtain the CPA license issued by the state, an individual must obtain 150 hours of college education, pass an extremely rigorous, psychometrically?valid exam; and gain experience in the field of accounting, taxation and attest competencies. Once the individual has obtained a license, they must participate in a renewal process requiring successful completion of continuing education; adherence to the state specified code of conduct, and demonstrated compliance with applicable professional standards.